For a woman, her wedding day is perhaps the most important day of her life. She will be meeting a host of people, including relations of her husband. They would expect her to look best and perfect in the wedding ensemble. She will also be photographed, and videoed a number of times. These images and videos will stay with her for the rest of her life. With so many important aspects of the wedding and high expectations of people, a woman may feel confused regarding her wedding wear. 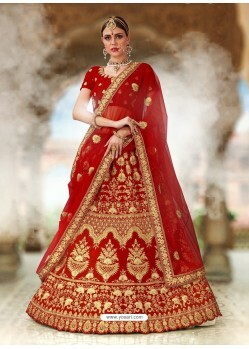 A bridal lehenga choli is the most suitable wedding attire for women of all ages. Being a traditional dress, it matches with the preferences of most Indian families. Moreover, when a bride wears lehenga choli and sits beside the groom, she looks no less than a princess. Of course, every woman wants to look like a princess on her wedding day and with a bridal lehenga choli, you can achieve the look effortlessly. What are the most popular styles of bridal lehenga cholis? Perfect bridal wear when you wish to get married in something new and fresh. This apparel is especially designed by trained designers. Before making any designs, they pay due attention to the ongoing fashion trends and creations that are displayed at the bridal fashion weeks. Based on them, the designers create designs, which come as an assurance to the bride-to-be woman that she will get to wear eye-catching outfit. 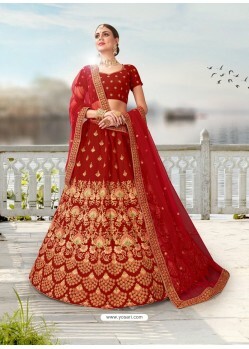 If you are in love with Indian customs and would like to be the demure Indian bride then traditional lehenga choli is the ideal choice for you. Contrary to what many people think, this type of bridal wear does not look outmoded. Rather, with the fantastic use of the color red, it suits every Indian skin tone. Moreover, in order to make the wear attractive and shimmering, a host of decorative materials is used. The most popular ones include zari, net, brocade, sequins, gota, and so on. The embroidery on it is also exclusive and generally done with hands. A fantastic option for the bride, who loves Bollywood actresses, in this category, the bridal dress is a close replica of what an actress wore at a fashion event or at an award function. By wearing similar attire, you can flaunt your love for the actress on your wedding day and feel confident of your beauty like her. Another top reason for choosing a Bollywood lehenga choli is affordability. Mostly, the originals worn by the actresses are designed by renowned designers. That is why their prices are always unreasonably high. However, by visiting online stores like YOSARI, you can purchase replicas of these clothes without breaking the bank. Along with several varieties of bridal lehengas, you will also find different types of bridal cholis. The specialty of these cholis lies in their decoration. Embellishments used in them are of highest volume and immense care is paid to their stitching. 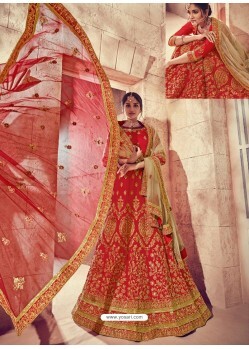 It is done for making the bridal choli as impressive as the lehenga. Stitching is performed in a way so that the decorations are not disturbed and retain their original elegance. Nowadays, jacket-style cholis are very popular. Mostly, they are sleeveless and work best for both pear shaped and apple-shaped body types. Other kinds of cholis include the ones with spaghetti straps, full sleeves, three-quarter sleeves, etc. If you do not mind flaunting your shoulders, you should go for the off-shoulder look. A great style tip for women, who do not prefer to wear sleeveless cholis, they can go for the ones that have sleeves made of net. For a more glamorous look, you can choose net sleeves with beautiful patchwork done on them. Is dupatta mandatory for bridal lehenga choli? The dupatta is an important accessory of the lehenga choli. It is worn not only as a cover but also as something that enhances the beauty of the dress as a whole. All bridal lehenga cholis come with the dupatta, which has explicit embellishments on it. Moreover, with several ways of draping it, you can easily customize your look to suit the flavor of your wedding. www.yosari.com is the place, which has one of the widest collections of bridal clothing. You will be pleasantly surprised to see their varied designs, patterns, and colors. Not only for the bride, the collection contains clothes for the all the female members of the family. Therefore, along with the bride, her sisters, friends, aunts, and mother can shop from YOSARI as well. Another great benefit that you can enjoy is the guarantee of high quality items. All our clothes are manufactured in state-of-the-art factories and experienced embroiderers put on the embellishments on the fabric. Consequently, our dresses always have the best looks that can make every woman look best on her wedding day. Have no apprehensions before placing your order with us. YOSARI delivers its products to a host of locations, which include not only India but also countries like Canada, the UK, the USA, and Australia. We also have the unique 14-day refund policy wherein you could send us back the item you bought within 14 days of its purchase and get your money back. With nothing to lose, begin wedding shopping now.